[James Shockley, my Uncle] Jim, married Wyona Hunt. They lived, in my earliest memory, on a little dirt farm near Coal Springs. Coal Springs is between Meadow and Glad Valley. I stayed with them when I was about eight years old for a month or so. They only had the one child then, Dora Lee. I think she was about four years old. Jim and family often visited us, but he and my Mom had a slight falling out. I think it was because Jim’s wife had a little baby boy that died, probably within the first year. The local priest wouldn’t bury the baby in the Catholic cemetery because they had never had him baptized, so they would never go back to church. Wynona’s parents [belonged to a different denomination,] so I suppose [this also helped] them to slide away from Catholicism. Anyway, my mother [was never especially close to] Wynona’s mother. [So, the kids and I] never became close. When I was in about the third grade, my folks sent me over to stay with the Jim’s family. At that time they lived somewhere around where the Veits live now, east of Thunder Butte by about six or seven miles. Well, I spent the first night sleeping with a bunch of the kids in the attic of their house (because it was warm up there). Willis (Bill) was a baby and squawked all the time. Wyona hung his diapers in the attic to dry. Because of the crying baby and the diapers, I got on my horse the next morning and never went back. In fact, they later moved to the log house that was our school house, and the school moved into a new board sided house. I didn’t see any more of them that I recall until Jim stepped on a clock gear that went through the hole in his shoe and stuck in his foot. Jim never knew that he had diabetes, so his feet were numb and he never knew about the clock gear until he got gangrene in his foot, blood poison set in, and he died. I would have been nine or 10 years old when he died [and he would probably have been close to 40 years old. This would have been about 1930 or 1931]. Wyona moved to Lemmon after Jim’s death and worked at whatever she could find to do. One man had a small motel at the time and he paid her to clean the rooms. She managed to raise all those kids and did a good job of it. I visited Wyona and the kids when I was in high school, probably two or three times. You know how it is—I was a big boy and [thought I was] sophisticated, and couldn’t be bothered with a woman and her kids. I have always regretted not seeing them or helping them more. Note—bracketed material inserted by the editor. 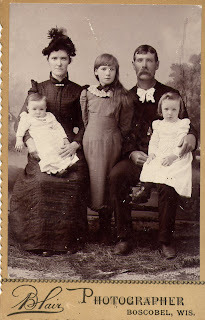 Here is a photo of my grandmother's family that probably was taken in 1893 in Boscobel, Wisconsin. This was long before her parents moved to Lake Williams, North Dakota, and about 19 years before she took up homesteading with her husband and family just northwest of Thunder Butte in South Dakota. On the left is my great-grandmother Catherine (Kane), who would have been about 33 at the time, with baby James Shockley on her lap at about one year of age. My grandmother's half sister Mabel stands in the center. Although we are unsure of her age, she was probably between eight and ten at the time. My great-grandfather, James Riley Shockley is seated on the right and would have been about 35 at the time this photo was taken. My grandmother, Mary, is seated on his lap and would have been four years old at the time. Baby brother James, pictured in the photo, and brother Joseph, who is not pictured because he would not be born yet for another couple of years, also took up homesteading not very distant from where my grandmother settled with her family in South Dakota.